Wenonah Hauter owns an organic family farm that provides healthy vegetables to hundreds of families as part of the growing nationwide Community Supported Agriculture (CSA) movement. Yet, as one of the nation's leading healthy-food advocates, Hauter believes that the local food movement is not enough to solve America's food crisis and the public health debacle it has created. In Foodopoly, she takes aim at the real culprit: the control of food production by a handful of large corporations--backed by political clout--that prevents farmers from raising healthy crops and limits the choices that people can make in the grocery store. Blending history, reporting, and a deep understanding of American faming and food production, Foodopoly is the shocking and revealing account of the business behind the meat, vegetables, grains, and milk that most Americans eat every day, including some of our favorite and most respected organic and health-conscious brands. Hauter also pulls the curtain back from the little-understood but vital realm of agricultural policy, showing how it has been hijacked by lobbyists, driving out independent farmers and food processors in favor of the likes of Cargill, Tyson, Kraft, and ConAgra. Foodopoly demonstrates how the impacts ripple far and wide, from economic stagnation in rural communities at home to famines overseas. In the end, Hauter argues that solving this crisis will require a complete structural shift--a change that is about politics, not just personal choice. Written with deep insight from one of America's most respected food activists, Foodopoly is today's essential guide for anyone who wants to reform our food system, from seed to table. Wenonah Hauter is the executive director of Food & Water Watch, a D.C.-based watchdog organization focused on corporate and government accountability relating to food, water, and common resources. She has worked and written extensively on food, water, energy, and environmental issues at the national, state, and local levels. She owns a working farm in The Plains, Virginia. "A shocking and powerful reminder of the distance between our image of the family farmer and the corporate agribusiness reality. Make sure you read it before dinner." "Foodopoly is a meticulously documented account of how we have lost control of our food system, as well as a roadmap for taking it back. We must respond to this call to action." "Food is life. Today food and life are being hijacked by corporations seed by Monsanto, trade by Cargill and giant agribusiness, retail by Walmart. And our earth, our farmers, our health are being sacrificed to increase corporate profits and control over our food systems. This is the story Hauter tells in Foodopoly. This is a story we must hear in order to create food democracy and food freedom." "Wenonah Hauter knows where the bodies are buried beneath the amber waves of grain. This is a terrific primer on the corporate control of food in the US, and the actions of those who fight back. By turns heartbreaking, infuriating and inspiring, Foodopoly is required reading for anyone who wants to understand both the scale of the challenge in reclaiming our food system, and the urgency for doing so." "This may be the most important book on the politics of food ever written in the US. Hauter doesn't buy the notion that we can buy our way to a healthy future. She puts the blame for our food crisis squarely where it belongs: on the political and agribusiness leaders who benefit from a corporate-dominated food system. Read this essential book and take action!" "Foodopoly makes a compelling case for how corporate consolidation and control of the food supply are at the root cause of a host of problems. Hauter is absolutely right that unless we break the stranglehold of corporate power with significant policy change, such as enforcing federal antitrust laws, the food movement will continue to have only marginal success." "A meticulously researched tour de force." "We all know how Monopoly ends: one person corners Boardwalk and Park Place and the rest are screwed. 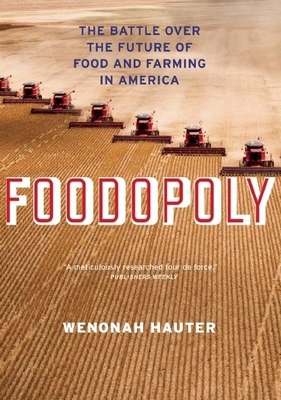 Winner-take-all is fine for a board game, but disastrous, as Wenonah Hauter reveals in this important new book, when it comes to our food. In compelling prose, Hauter breaks down why the concentration of corporate power over food mattersand what we can do about it. Kudos to Hauter for this vital bookessential reading for anyone who wants safe food and clean water."